There are few things worse than dropping everything you have in the shower. The water makes everything wet and slippery and the floors are hard, easy for breaking things. You don’t want to drop your clothes or your towel, you have no idea what’s touched those floors. There’s hardly any room to put shampoo bottles, shaving cream, and the countless other shower necessities. Understandably, many freshmen don’t even consider the shower situation in the dorms during the hectic times of moving in, but it may be one of the biggest mistakes. The shower tote is an indispensable item for any college freshman due to its cheap price and stress preventing use. At no more than $10 at most major retailers, such as Target, Bed Bath & Beyond or online on Amazon, this one-handed shower accessory will solve your shower issues leaving you with an extra hand to carry whatever other bathroom needs you may have! 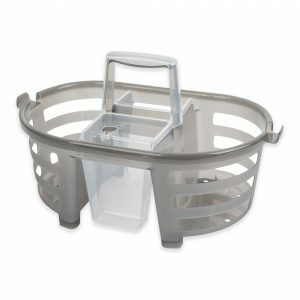 You can easily prevent early morning stress and shower accidents with the use of a shower caddy. Made with plastic or mesh, these totes can have many pockets or just be a basket in which you can put everything you need for the bathroom and shower. These totes are large enough for plenty of bottles and containers, and most either have handles to hang in the shower or are built to sit atop the curtain rod as shown below. Save yourself the added pains of dropping all your shower gear in the mornings and get yourself a shower tote! Hop your way down to HopCat!